Tomatoes are my favourite food. Every since I was little I have eaten lots and lots of tomatoes. In our first season on the allotment back in 2011 we attempted to grow greenhouse and outdoor tomatoes. It appeared the outdoor ones were not too fond of our lovely Lake District weather, so last year we didn't even bother with any outdoor tomatoes and just stuck to growing well-known varieties (Gardener's Delight, Sungold, Ailsa Craig) in the greenhouse. 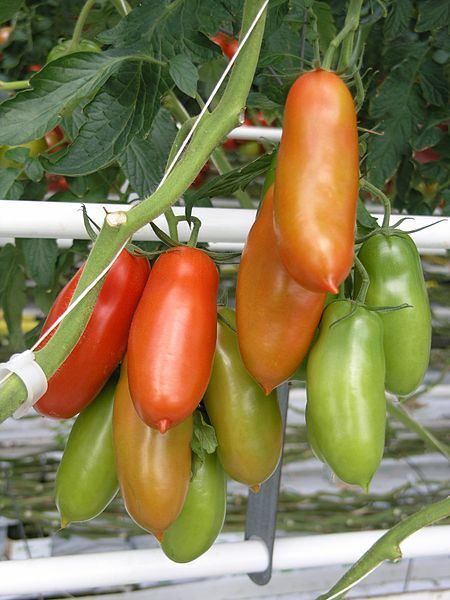 I've had San Marzano tomatoes before, and they are very tasty, however I am particularly looking forward to growing the tigerella. I'm not quite sure how I will manage to fit all of these into our little greenhouse. They are all suitable for growing both outside and in the greenhouse. So if the weather cooperates this year and provides us with a lovely hot and long summer I could maybe make use of all my seeds! I'm growing San Marzano this year, I did a couple of years back & they make a lovely sauce. Surprisingly I did quite well with tomatoes last year given the problems with blight and the weather. On the plot I'll be trying Outdoor Girl for the first time, and Golden Queen which I've grown before. At home on the windowsill I'll be growing Red Robin again. I have grown three of the ones you are going to try the only one that didn't quite come up to expectations was Red Pear which I found tasteless. Good luck. Oh that's a bit disappointing. If I run out of space I might give the Red Pear a miss then. Fear not! There is ALWAYS space for one more tomato plant. You'll like Tigerella I'm sure - very reliable, prolific, good-looking and tasty. I've had good results with Ildi too - it produces enormous quantities of fruit on trusses that look very like bunches of grapes. It's also worth investigating Ferline, which has high blight-resistance. I've grown it several times and it always seems to do well.